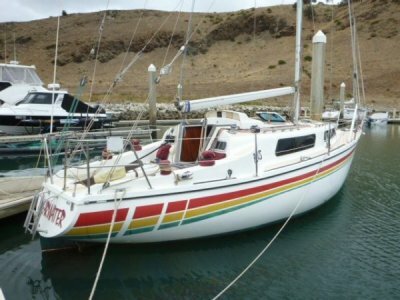 'Shearwater ' this boat is in excellent condition and for its size she has so much to offer. Separate head, V berth, double aft cabin, nav station with new instrumentation and electrics, a galley well set up with heaps of bench space and a saloon that has been stylishly finished off and boasts heaps of head room allowing easy access from the cockpit to the galley. The engine has been recently been rebuilt and has only a few hours on it. This boat has given hours of fun and entertainment to the current owner with many trips from Wirrina to Kangaroo Island she will be coming to Adelaide soon for scheduled maintenance so give me a call and organise a time to see her.